While migration and population settlement have always been an important feature of political life throughout the world, the dramatic changes in the pace, direction, and complexity of contemporary migration flows are undoubtedly unique. Despite the economic benefits often associated with global, regional, and internal migration, the arrival of large numbers of migrants can exacerbate tensions and give rise to violent clashes between local populations and recent arrivals. This volume takes stock of these trends by canvassing the globe to generate new conceptual, empirical, and theoretical contributions. The analyses ultimately reveal the critical role of the state as both an actor and arena in the migration-conflict nexus. This book is the first truly global analysis of how migration flows interact with culture, economics, and state authority to create conflict. Migration today is reshaping politics around the world; Côté, Mitchell, and Toft’s volume cuts through the clichés and provides a nuanced understanding of how states can reduce or exacerbate the risks that arise from people on the move. This volume makes an important contribution to the literature on ethnic and civil wars. The authors challenge the current classification of domestic conflict by adopting a novel and underutilized theoretical framework that highlights the role of internal migration in triggering violence between the migrants and the "indigenous" inhabitants of a territory. . . . A must-read for anyone interested in both conflict and migration. International agencies, governments, and NGOs too often miscalculate the long-term political implications of migration and resettlement – both for migrant and receiving communities.It is hardly their fault. Social scientistshave yet to meld a body of theory that accounts for origins, identities, particular circumstances, and community relationships. People Changing Placestakes up the task and makes important strides toward such a theory. 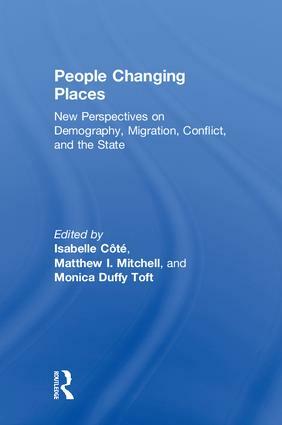 People Changing Places is essential reading for all scholars interested in migration and political demography more broadly. By weaving together both qualitative and quantitative research, as well as numerous case studies from the developing and the developed world, the authors add significantly to our knowledge about the often complex relationship between internal and external migration, demographic change, and the outbreak of violent conflict. PART IV: Migration and Conflict in the Global North? Isabelle Côté is Assistant Professor of Political Science at Memorial University of Newfoundland. Matthew I. Mitchell is Assistant Professor of Political Studies at the University of Saskatchewan. Monica Duffy Toft is Professor of International Politics and Director of the Center for Strategic Studies at Tufts University’s Fletcher School of Law and Diplomacy, and a Global Scholar with the Peace Research Institute, Oslo.